The Left has always favored Thomas Jefferson over Alexander Hamilton. But not only was Hamilton more progressive for his time, he has lessons for our response to climate change. Two hundred years ago, Alexander Hamilton was mortally wounded by then Vice President Aaron Burr in a duel at Weehawken, New Jersey. Their conflict, stemming from essays Hamilton had penned against Burr, was an episode in a larger clash between two political ideologies: that of Thomas Jefferson and the anti-Federalists, who argued for an agrarian economy and a weak central government, versus that of Hamilton and the Federalists, who championed a strong central state and an industrial economy. In the American political imagination, Jefferson is rural, idealistic, and democratic, while Hamilton is urban, pessimistic, and authoritarian. So, too, on the US left, where Jefferson gets the better billing. Michael Hardt recently edited a sheaf of Jefferson’s writings for the left publisher Verso. Reading “Jefferson beyond Jefferson,” Hardt casts him as a theorist of “revolutionary transition.” We like Jefferson’s stirring words about “the tree of liberty” occasionally needing “the blood of patriots and tyrants,” and his worldview fits comfortably with a “small is beautiful” style localism. We recall Jefferson as a great democrat. When Tea Partiers echo his rhetoric, we dismiss it as a lamentable misunderstanding. But in reality, Jefferson represented the most backward and fundamentally reactionary sector of the economy: large, patrimonial, slave-owning, agrarian elites who exported primary commodities and imported finished manufactured goods from Europe. He was a fabulously wealthy planter who lived in luxury paid for by slave labor. Worse yet, he raised slaves specifically for sale. Even if it could somehow be dislodged from the institution of slavery, Jefferson’s vision of a weak government and an export-based agrarian economy would have been the path of political fragmentation and economic underdevelopment. His romantic notions were a veil behind which lay ossified privilege. Hamilton was alone among the “founding fathers” in understanding that the world was witnessing two revolutions simultaneously. One was the political transformation, embodied in the rise of republican government. The other was the economic rise of modern capitalism, with its globalizing networks of production, trade, and finance. Hamilton grasped the epochal importance of applied science and machinery as forces of production. 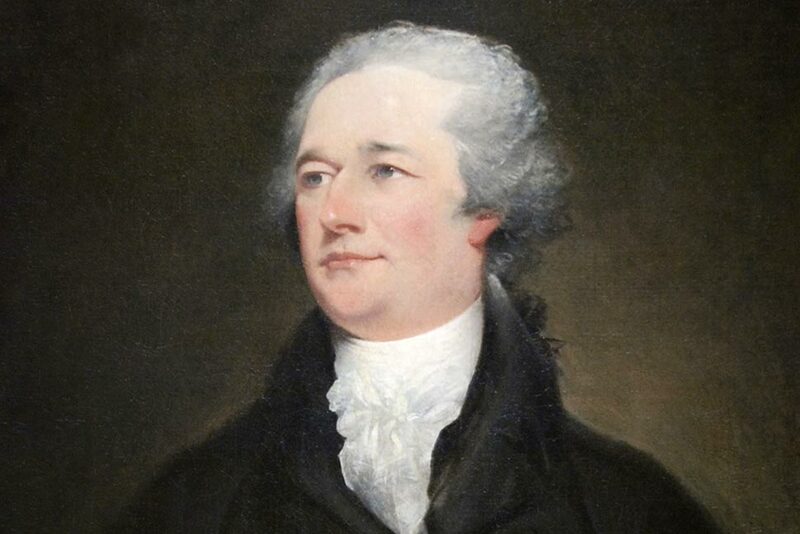 Even today, Hamilton’s ideas about state-led industrialization offer much. Consider the crisis of climate change. Alas, we do not have the luxury of making this an agenda item for our future post-capitalist assembly. Facing up to it demands getting off fossil fuels in a very short time frame. That requires a massive and immediate industrial transformation, which must be undertaken using the actually existing states and economies currently on hand. Such a project can only be led by the state — an institution that Hamilton’s writing and life’s work helps us to rethink. Hamilton learned the danger of weakness early on. Born of humble origins in the Caribbean, he was an “illegitimate” child and then orphaned at age thirteen. Taken in by friends, he found work as a shipping clerk. Having a prodigious intellectual talent, Hamilton also applied himself to study with fanatical discipline. Soon he was penning essays for the local press. One piece caught the attention of St. Croix notables, who in 1772 sent the young Hamilton to preparatory school in New Jersey and then to Kings College, now Columbia University. Hamilton wanted to command troops in the field and disliked Washington, whom he found crass and dull. Washington nonetheless kept the young savant on as part of “the family,” as the general called his staff. At the war’s end, Hamilton resigned his commission and studied law. Meanwhile, the country’s economy was in shambles. Officers and farmers were growing restive. Parts of the backcountry of North Carolina declared themselves an independent state, and a similar attempt at secession was made in Pennsylvania’s Wyoming Valley. By 1786–87, class tensions in western Massachusetts had boiled over in the form of Shays’ Rebellion: Armed and indebted farmers marched on the state government and were violently crushed by the militia. Hamilton knew that economic recovery was the key to peace. In the same Federalist paper, he wrote:“If SHAYS had not been a desperate debtor it is much to be doubted whether Massachusetts would have been plunged into a civil war.” To prevent national disintegration and push the economy back into action, Hamilton sought to control the centrifugal forces of “faction” — a term which referred to both class and geographic conflict. He labored hard to draft and ratify a new Constitution and create a strong central government. Recall the Supremacy Clause: “This Constitution, and the Laws of the United States. . . shall be the supreme law of the land; and the judges in every state shall be bound thereby, anything in the constitution or laws of any state to the contrary notwithstanding.” In other words, federal law always trumps state and local laws. Here, Hamilton is outlining the central mechanism of economic nationalism: the state creates economic conditions; it does not merely react to them. Before the Revolution, Britain’s mercantilist policies sought to maintain captive markets and thereby enforced under-development on its American colonies. Britain had banned export to America “of any tools that might assist in manufacture of cotton, linen, wool, and silk.” None of that changed with independence. And Britain was soon harassing American trade, stopping and searching ships at sea, seizing American sailors as alleged deserters. But in all this, Hamilton faced the opposition of Jefferson and the Southern planter class. Comparative economic history shows that semi-feudal agricultural elites, like Jefferson’s Virginia squire-archy, hold back political and economic development. To paraphrase Perry Anderson, semi-feudal elites extract economic surplus from the immediate producers by customary forms of extra-economic violence and coercion; they do so by demanding labor services, deliveries in kind, or rents in cash, and preside over areas where free commodity exchange and labor mobility are relatively rare. They prefer stasis to change. While we have land to labor then, let us never wish to see our citizens occupied at a work bench… let our work shops remain in Europe. It is better to carry provisions and materials to workmen there, than bring them to the provisions and materials, and with them their manners and principles . . . The mobs of great cities add just so much to the support of pure government as sores do to the strength of the human body. Hamilton’s critique of the Physiocrats was sharp and devastating. “It has been maintained, that Agriculture is, not only, the most productive, but the only productive species of industry,” he wrote. The reality of this suggestion in either aspect, has, however, not been verified. . . It is very conceivable, that the labor of man alone laid out upon a work, requiring great skill and art to bring it to perfection, may be more productive, in value, than the labour of nature and man combined, when directed towards more simple operations and objects. In dismantling the Physiocrats’ fixation with agriculture, Hamilton was also taking aim at slavery and the self-delusions of the plantation elite. The Southern elites were increasingly defensive of their “peculiar institution.” Vermont outlawed slavery when it broke away from New York in 1777. Pennsylvania severely restricted slavery in 1780, while Massachusetts abolished it outright in 1783. To level the playing field, the weaker economy had to rely on“the extraordinary aid and protection of government.” And he pointed out that other governments aided their manufacturing sectors — the doctrines of British political economy notwithstanding. Pretty much all of this was achieved, despite Southern opposition — and it remains the basis for the growth of American capitalism. If the private sector could not consume enough to drive rapid industrialization, the public sector would. Since few export markets could absorb American manufactured goods, military procurement would created an artificial internal market for them. America’s nascent manufacturing sector relied heavily on military consumption — products associated with shipbuilding, weapons, munitions, uniforms, and food rations. This socialized demand would drive private sector accumulation, investment, wages, and thus consumption. Clay and his supporters added a commitment to maintaining artificially high public land prices. This boosted the government revenue needed to fund land surveys, roads, canals, ports, and later railroads. High public land prices also benefited eastern manufacturing, since cheap land would draw off labor and force up wages. Ultimately, the American System was only partially realized and more often than not at the state level, as in the famous New York state-built Erie Canal. The developmentalist camp — the largely northern, urban, manufacturing and financially-oriented interests that followed Clay — ultimately coalesced into the Whigs, and then Lincoln and the Republican Party. Only with war and the secession of southern states did the Hamiltonian-inspired agenda make real headway with passage of the Homestead Act, opening western lands to small farmers, and the Railroad Acts which, at government expense, set off construction of the transcontinental railroad. This American dirigiste model has had a major impact on global history. As the South Korean economist Ha-Joon Chang has pointed out, every successful case of industrialization has used some version of the Hamiltonian model. A line runs directly from it to the postwar rise of the developmental states of East Asia. During Henry Clay’s heyday as John Quincy Adams’s Secretary of State, the German political economist Fredrich List — who would formulate the developmentalist theory of “infant industry” protection — moved to Pennsylvania where he soaked up the statist ideas of Hamilton and Clay. In most of the world, the real story of capitalism is not the story of laissez-faire — a doctrine the strong impose upon the weak — nor a quaint story about egalitarian local economies, but the story of the state presiding over a mixed economy. Hamiltonian developmentalism — the unnamed ideology — is amoral, pragmatic, instrumentalist, and flexible. Unfortunately, American society is very far from facing the crisis. And a huge part of the problem is the Jeffersonian notion that “the government that governs best is the one that governs least.” While that is true as regards individual liberty, it is absolutely dangerous to think that way as regards the economy.